The Smithsonian's National Museum of American History will commemorate the 15th anniversary of the Sept. 11 attacks with a special one-day exhibition and a ceremony marking the donation of the last existing robot used in the search and rescue effort. The robot will be donated by its inventor, Dr. Robin Murphy from the Texas A&M Engineering Experiment Station and Texas A&M University. On Sunday, Sept. 11, from 11 a.m. − 4 p.m. in Flag Hall, the museum will display more than 35 objects from the three sites—New York, the Pentagon and Shanksville, Pa.
To create an intimate experience for visitors, the objects will be shown on tables rather than behind glass and include airplane fragments, lights from a crushed FDNY fire truck, a flight attendant's handbook from Flight 93, clothing and equipment from first responders, and objects recovered from offices at the Pentagon. "Americans continue to live with the impact of Sept. 11," John Gray, director, National Museum of American History, said. "That day marked a generation, and will forever be one of remembrance." The museum will show the Smithsonian Channel documentary, 9/11: Stories in Fragments, hourly from 11 a.m. − 4 p.m. in the Warner Bros. Theater. The documentary is based on the museum's Sept. 11 collections and the stories they convey. The film features museum curators and object donors speaking about the collection and telling the stories of victims, witnesses, bystanders and heroes from New York, the Pentagon and Shanksville. There will be a conversation in the Coulter Performance Plaza at 1 p.m. with Murphy who deployed ground, air and marine robots─including Bujold, an Inuktun microVGTV robot used following the Sept. 11 attacks─at more than 24 disaster sites worldwide. 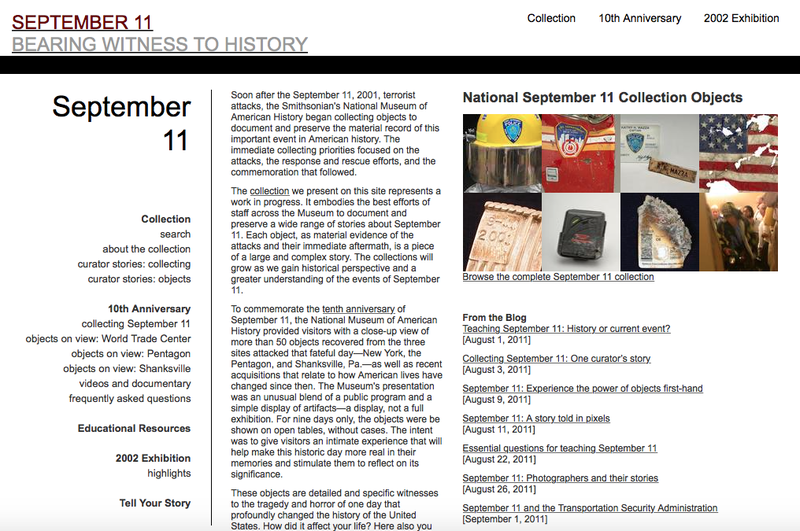 In 2001, Congress designated the museum as the official repository for Sept. 11 materials so that objects, photographs and documents would be preserved permanently in the museum's collections to help future generations of historians and visitors comprehend the horrific events of Sept. 11, 2001, their roots and their long-term consequences. 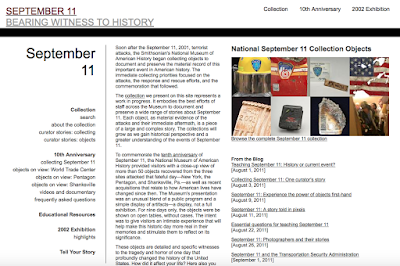 The museum's Sept. 11 collection may be viewed at americanhistory.si.edu/september11.